A goal in each half is just enough for under pressure Scotland to earn their first three points of Group I, defeating San Marino but doing little to appease their critics. Battered and bruised from the beating inflicted in Nursultan on Thursday night at the hands of Kazakhstan in their opening UEFA EURO 2020 qualifier, an embarrassed Scottish nation couldn't have asked for an easier game in their attempts to get back on track with San Marino, the lowest ranked side in the FIFA World Rankings, the opposition on Sunday evening. Scotland have faced intense scrutiny since their horror show on opening night and made the trip to this enclaved microstate under the microscope. This nation's pride is hurt and the Tartan Army also travelled in their numbers to Serravalle asking questions of their manager and the Scottish Football Assosciation that this fixture did little to provide the answers to. This match looked to provide the perfect tonic for Alex McLeish, a chance to alleviate the pressure on his own shoulders against a side that have won just one fixture in their history, drawn only four and lost the other one-hundred-and-fifty. Twenty-three goals scored and well over six hundred conceded too. If there was ever a game to get the confidence back for the visitors, this was it. This was a much changed Scotland side from the one that lined-up on Thursday. Andy Robertson returned at left-back after a dental problem while Stephen O'Donnell, Johnny Russell and Kenny McClean were also named in the starting eleven. Callum Paterson and Ryan Fraser, unable to play on the synthetic surface in Kazakhstan, were enlisted to lift the mood of a nation up front and on the wing respectively. The Scots started exactly like a side looking to clear the dark clouds that have been circling around them and were in front after just four minutes. McLean had a shot moments earlier wide but he was on target this time, a glancing header at the end of Fraser's cross to find the bottom corner of the net. Stuart Armstrong could and should have doubled the lead on the 21st minute. The knockdown from Patterson allowing the Southampton midfielder a shot at goal parried by Elia Benedettini before the Novara goalkeeper stretched himself brilliantly to deny the rebound. This all should've been the precursor to a dominating, goals-laden performance against the whipping boys of Europe. Instead, Scotland struggled to create any chances and it was San Marino that grew in confidence, breaking into the Scottish half with more regularity and causing a few skipped heartbeats as Adolto Hirsch found the side netting. Mirko Palazzi offered more encouragement for the home side with a shot skewed wide soon after. These chances, while not particularly threatening, were concerning viewing for those in the stands as they continued to let their feelings be known towards Scotland's governing body with rather colourful language. The second half didn't provide much better from Scotland. Palazzi was at it again, bringing a shot well wide of goal, but there was belief growing in the home ranks that something historic could be on the cards as the Scots continued their sluggish play, easily winning the possession battle and wracking up corners but managing to do little else. It took until the 71st minute for an injection of fresh energy via substitute James Forrest. The Celtic winger took only three minutes to influence the game, assisting for Russell, who kept his composure to leave the goalkeeper seated, finishing high into the roof of the net. Scotland's performance in the closing stage of the match was much improved and they actually looked like adding to their lead against a visibly tiring home side. Marc McNulty headed wide from close range while another promising attack was ended with another poor pass, something that had become the theme of the evening. The final whistle brought the end to a difficult international break for Scotland as they settled for their traditional two-nil victory away to San Marino. Three times previously they have visited this part of the world and finished with the same scoreline but none of those fixtures were met with quite the apathy of this one in 2019. If McLeish and his squad were keen to begin the recovery from their humbling against Kazakhstan, they did little to show it on a night when they needed a pick-me-up more than ever. With the supporters on their backs, the team and manager delivered a turgid display that would've ended in a very different result against any other side not named San Marino. In games like this against opposition like this, teams can play this poorly and still win but given the criticism thrown the way of McLeish over the weekend, it did little to improve his standing as the manager of the national side. Scotland got the job done on the night but a nation expected a good display with plenty of goals and they were given neither. The Scottish formation did little to help their performance at the Olimpico di Serravalle as the manager opted for four at the back including two defensive midfielders in the team. 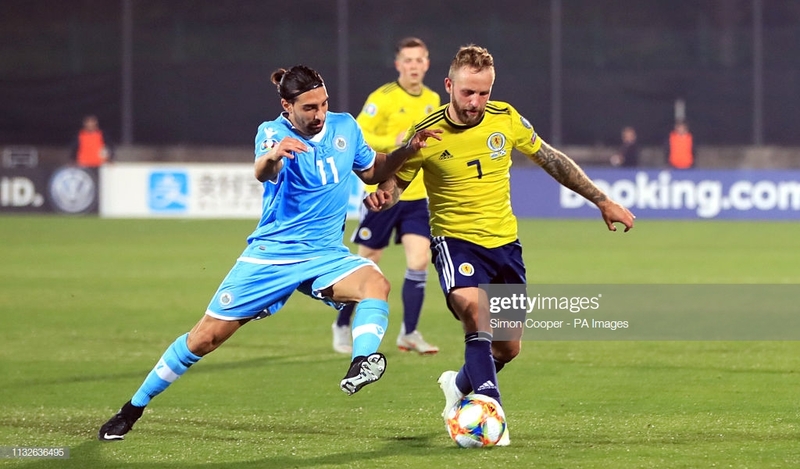 With Scotland enjoying the possession and San Marino offering little threat, it was a curious line-up which helped to blunt the creativity in the team. Scotland fans are used to the disappointment of following their national team around the world. They haven't qualified for a major tournament since 1998 but even by their standards, Thursday was a galling defeat that was hard to stomach for these hardened supporters, many of whom had journeyed on from Kazakhstan. The content of the chants from the stands are not fit to repeat in this report but the SFA have been blasted for their appointments and general decision-making when it comes to the national team in recent years and after the latest crushing defeat, the away fans were keen to let those at the top know all about it. It remains to be seen if anything will change between now and the next international break in June but the Tartan Army aren't happy and were far from convinced by the latest display judging by the boos that greeted the final whistle. McLean and Russell were the two players that really made the difference for Scotland by grabbing the all-important goals. McLean ensured any initial nerves were banished while Russell buzzed around the pitch all game, visibly frustrated by the lack of opportunities, but dedicated all the same. This is a man that travels from the USA every time his country calls so it was no surprise to see his commitment had not wavered. Forrest didn't start on the night but was responsible for providing urgency that was lacking throughout the entirety of the match. He created the second goal and also manufactured two or three further chances to enhance the scoreline. Perhaps if he had started, Scotland would've scored the extra goals they craved. San Marino aren't short on spirit and the effort was evident throughout. Benedettini in goal produced one stellar save to deny Armstrong while in front of him was the captain, no-nonsense Davide Simoncini, a key figure at the back for the home side and was one of the players to leave an impression. Palazzi offered a few shots on goal while Filippo Berardi, on the books of Italian cracks Torino, looked useful on the ball. He is the highest profile player in the current side and may well be the heir to the throne of the departed Andy Selva, the top-scorer and most-capped player in San Marino's history. Scotland came to this city on the edge of the Apennine mountains facing an avalanche of criticism from all sides. They brushed themselves down and found the three points in Serravalle on Sunday but this is a national side with much work to do and decisions to be made.